There are different types of Acne ranging from pimples, whiteheads, blackheads to deep cystic legions and scaring. To control acne, it is important to use skin products that help control oil production in the skin, exfoliate it (to prevent dead skin build-up), and keep acne causing bacteria at bay (with anti-bacterial and pH regulating ingredients). Topical skin products remain the first line of defence against all types of acne. However, over-the-counter brands bought without any medical advice often deliver suboptimal results. At MySkinSolution™, we have chosen some of the best medical grade topical skin products to help control acne. 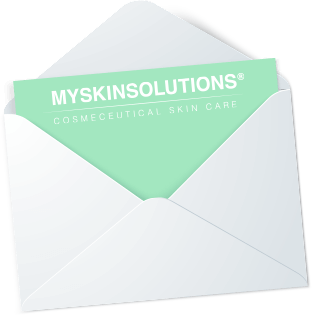 If you are not sure which products to choose, please ﬁll in our Online Skin Consult form, and we will be able to give you professional advice. Skin ageing is a natural process and everyone experiences it. However, premature skin ageing due to excessive sun damage or any chronic illness is preventable with a good skin care routine. Preventative anti-ageing products are focused on preservation and maintenance using antioxidants to protect your skin from environmental factors that attack the skin’s cells causing the tell-tale signs of ageing. When your skin is showing signs of ageing such as lines, wrinkles, and changes in the texture, tone, and colour; it’s time to get serious about your skincare. Intense anti-ageing products focus on resurfacing and repairing as well as replacing lost nutrients and hydration. Topical skin products remain the first line of defence against all types of photo ageing. However, over-the-counter brands bought without any medical advice often deliver suboptimal results. At My Skin Solution, we have chosen some of the best medical grade topical skin products to help minimise the signs of ageing skin. If you are not sure which products to choose, please ﬁll in our Online Skin Consult form, and we will be able to give you professional advice. A dehydrated skin feels tight and sometimes uncomfortable with noticeable fine lines. Apart from looking dull and lifeless, a dehydrated skin lacks the water that is essential for proper functioning. This can lead to further problematic skin conditions and premature ageing. Products that contain ingredients that stop further loss of water from the skin, as well as those that bind water and attract water to the skin (such as Hyaluronic Acid) are essential in treating dermal dehydration. Dry skins tends to be sensitive, itchy and appear flaky, scaly and dull. Dry skin lacks lipids (oils) and often goes hand in hand with dehydrated skin (lacking water). This is due to the disturbance of the skin’s natural barrier, which allows the moisture to escape from the skin. It is vital to keep the moisture content of the skin up with moisturisers and hydrating serums. Gentle exfoliation will also help reduce flaking and bring back the glow! Pores can appear enlarged due to an excess of oil production and accumulation of dead skin cells. Normal ageing and excessive sun exposure can also cause the pores to appear enlarged. To help minimize the appearance of pore size, products containing salicylic acid often work well. It is also important to keep the skin hydrated but avoid using any heavy creams. Hormonal hyperpigmentation most commonly appears during pregnancy or with the use of contraceptive pills. UV radiation triggers it. Melasma/chloasma known as the ‘pregnancy mask’ usually appears in a symmetrical fashion over the face. Avoiding further UV exposure and the use of pigment controlling products known as ‘Tyrosinase Inhibitors’ are important in controlling the production of melanin (pigment/colour) in the skin. Increasing the turnover of skin cells through exfoliation will lighten discolouration. If you are pregnant or breastfeeding you must avoid products containing Salicylic Acid & Vitamin A (retinol), and opt instead for Lactic Acid or Enzymes. It is essential to ensure strict use of a high-quality SPF product every day when treating hyperpigmentation. This is due to sun damaged skin. There are a few factors to consider when treating this challenging skin condition. The use of pigment controlling products known as ‘Tyrosinase Inhibitors’ will control the production of melanin in the skin, preventing the formation of new sun spots. Increasing the turnover of skin cells through exfoliation will lighten discolouration. Vitamin A (retinol) is key to normalising the melanin activity as well as being resurfacing. Using antioxidants will help protect against further damage. Vitamin C works specifically to brighten the skin. When treating hyperpigmentation strict daily use of high-quality SPF products is essential. At My Skin Solution™, we have chosen some of the best medical grade topical skin products to help control skin pigmentation. If you are not sure which products to choose, please ﬁll in our Online Skin Consult form and we will be able to give you professional advice. Australians have the highest incidence of skin cancers in the world. Luckily, Australian men are slowly becoming more mindful of their skin’s health. • Prescription-only skin products for speciﬁc skin concerns. Topical skin products remain the first line of defence against all types of common skin concerns. However, over-the-counter brands bought without any professional input often deliver suboptimal results. At My Skin Solution™, we have chosen some of the best medical grade topical skin products to help minimise the signs of ageing skin. Oily skin appears shiny, with enlarged pores and is often associated with breakouts. It is important to keep an oily skin clean without over-drying. Well exfoliated skin is also crucial to minimise the chances of those pesky pimples! Products such as toners can prove very beneficial for those experiencing oiliness in the T-Zone region of the face. Facial redness, flushing, visibly broken blood vessels and skin sensitivity can all be signs of rosacea. Small, red, pus-filled bumps showing during a flare-up are the trademark of a true rosacea skin. Whether you are suffering from hyper-sensitive red skin or rosacea, it is important to treat your skin gently and avoid UV damage. Introduce new products slowly and carefully. The use of topically applied scar treatments can improve the look of new pink or red scars. Old scars that have gone beyond this point will require clinical intervention with lasers and scar reduction therapies. Sensitive skins appear thin and fragile and generally reacts to a lot of products applied to the skin with a tendency to redden easily. The use of mild products that are not overly stimulating and contain calming and soothing botanical ingredients are a great place to start when treating your sensitive skin. AHA’s are mainly used for their exfoliating properties to soften the skin and noticeably improve photodamaged skin (skin aged/damaged by the sun). Regular use of AHA’s lighten discolouration on the skin’s surface and increase skin renewal to reduce the appearance of fine lines & wrinkles. AHA products are best used at night time, daily for thicker and oilier skin types or three times per week for more sensitive skin types. It is recommended to use an SPF during the day when incorporating AHA products in your skin care routine. Salicylic Acid is a Beta Hydroxy Acid (BHA) commonly used for exfoliation. Being an oil-soluble acid means it is highly effective in penetrating sebum (oil) filled follicles to deep clean and decongest clogged pores. BHA’s are most suitable for oily and thick skin and are an excellent choice for acne treatment due to the specific bactericidal action against Propionibacterium acne (acne-causing skin bacteria). BHA products are best used at night time, the frequency of use depends on product type (please see individual product for usage instructions). It is recommended to use an SPF during the day when incorporating BHA products in your skin care routine. Enzymes are a gentle yet effective choice for exfoliating the skin; they increase the activity of naturally occurring enzymes in the skin that are responsible for breaking down the bonds that hold dead skin cells together to reveal a smoother, brighter skin that glows. Suitable for most skins, enzymes can be added to your skin care routine up to three times per week, depending on skin type. Growth Factors are naturally occurring proteins that play a major role in maintaining healthy skin function and structure. As you age, your body’s natural production and preservation of growth factors slow dramatically. Topical application of Growth Factors helps repair damage and increase skin health to improve ageing skins for a noticeable improvement in skin texture and tone. For skin repair, it is recommended to use Growth Factors twice a day and once a day for maintenance. Well known for its excellent water-binding capabilities, Hyaluronic Acid can hold up to 1000 times its own weight in water. Hyaluronic Acid brings a host of benefits for the skin, including an immediate smoothness to rough skin surfaces, plumping effects to reduce the appearance of fine lines and wrinkles as well as long-term benefits of increased hydration. Suitable for all skin types, especially dry and dehydrated to use daily morning and night. Peptides are small chains of amino acids which are the building blocks of proteins, and proteins are the building blocks of the skin! The many different types of peptides offer different benefits for the skin. The most commonly sought after and used peptides signal collagen production for stronger, firmer, younger-looking skin. Other peptides are used to deliver active ingredients deeper into the skin for enhanced results, and some for their healing properties. All peptides have a cumulative action and need to be used once to twice per day for optimal results. Retinol is considered the gold standard in anti-ageing treatment but also key in treating acne skin conditions. This powerhouse vitamin resurfaces the skin with the proven ability to transform the skin’s texture, leaving it firm and smooth. Known as the ‘normalising’ vitamin, it keeps skin healthy and clear. Most retinol products should only be used at night time. It is recommended to slowly build up the use of retinol products with initial usage two to three times per week, increasing to nightly use as the skin builds up a tolerance. It is essential to use an SPF during the day when incorporating retinol products in your skin care routine. No retinol products are suitable for pregnant or breastfeeding women. Vitamin B is essential for anyone with skin in need of a boost. Vitamin B increases cellular energy helping to improve the overall function of the skin and boasts a range of benefits for every skin type including oil regulation, brightening effects, hydration, and increased barrier function for a healthier less sensitive skin. All skin types can benefit from the use of Vitamin B, morning, and night. Vitamin C is one of the most popular and commonly used ingredients in skin care, with good reason! A potent antioxidant, Vitamin C provides superior protection against damaging environmental stressors. Daily use will not only protect the skin but also brighten, calm, and strengthen the skin through its ability to build collagen. Vitamin C is best used in the morning to help protect the skin against UV damage when used in combination with an SPF product.